Conrad's small, ruggedly built professional presses, backed by a 25-year manufacturer's warranty, can withstand the rigors of classroom use in printing etchings, woodcuts, collagraphs, and monoprints. Conrad presses have many of the same design elements as much larger presses. Deluxe models have a planetary reduction drive to provide smooth and easy operation under the heaviest pressure. The torque from the 10" (25 cm) throw aluminum hand crank is multiplied in the totally enclosed geared planetary reducer by a 6:1 ratio. Conrad presses resist twisting and tipping because of their base construction. They are constructed with a 16-gauge electrogalvanized sheet riveted together to form a sturdy box section extending to the full length at the bed plate. For strength with minimum weight, the vertical frame is constructed of 1¼" (32 mm) square section high tensile aluminum. Height adjustment is maintained via a spring counter-balanced upper roll. 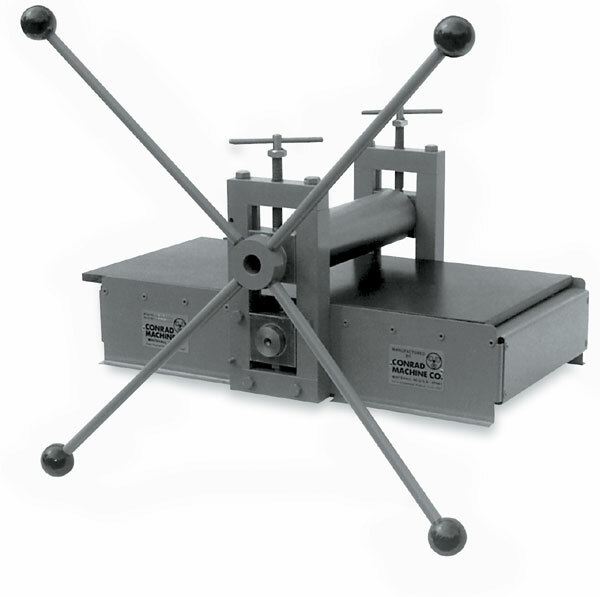 Micrometer Gauge — Conrad presses are available with an optional micrometer gauge. It allows you to adjust each pressure screw by as little as .005" (about the thickness of a human hair) per line. If you want precision, the micrometer gauge delivers it.